Are you wondering why some areas of your home don’t stay warm or cold? Your home is the place for you to be completely comfortable. But most homes have areas that suffer because you are asking a single thermostat located in one area to control the temperature in all parts of your home. The thermostat only knows the temperature where the thermostat is actually located! You simply cannot achieve whole home comfort with one thermostat, just like you can’t (and don’t want to) control all your lighting with one light switch. Zoning is a control system designed for the way you use your home. 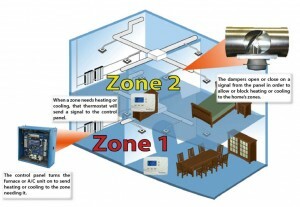 With a zoning system, each area of your home is given customized heating and cooling control. Best of all, zoning can be installed affordably, without disrupting your life. For more information about zoning systems, contact us at 216-663-6462!